We reached Newborough Forest towards the end of a fine summers day... pristine sands backed by pine forest and shell white dunes at the south-western tip of Anglesey. We hurriedly pitched our tent and followed a path that led us the mile or so down to Llanddwyn Island nature reserve. Quite the reward after a long drive. We watched dolphins breaching under the setting sun and marvelled at far reaching views out to the mountains of Snowdonia. Returning to camp after dark, we fell asleep excited at the prospect of exploring the National Park the next day. Newborough forest was planted between 1947 and 1965 with Corsican pine trees for timber to protect the village of Newborough from wind-blown sand and to stabilise the shifting sand dunes. The Forest is a stronghold for the red squirrel, the U.K’s only native squirrel species. Anglesey’s red squirrels continue to be the focus of concerted efforts to conserve them and to increase the size of the population. We had seen pictures of Dinorwig Slate Quarry online before arriving but hadn’t really grasped the scale of the mine carved out of Elidir mountain. I’m reading the Hobbit to my son at the moment and having just finished the Mines of Moria chapter, we spent much of the day exploring this redundant quarry looking over our shoulder for Elves and Orcs! The existence of a slate industry in Wales dates back to the Roman period, when slate was used to roof the fort at Segontium, now Caernarfon. The industry grew slowly until the early 18th century, then expanded rapidly until the late 19th century, at which time the most important slate producing areas were in northwest Wales, including the Penrhyn Quarry near Bethesda, the Nantlle Valley quarries, Blaenau Ffestiniog and the Dinorwig Quarry. 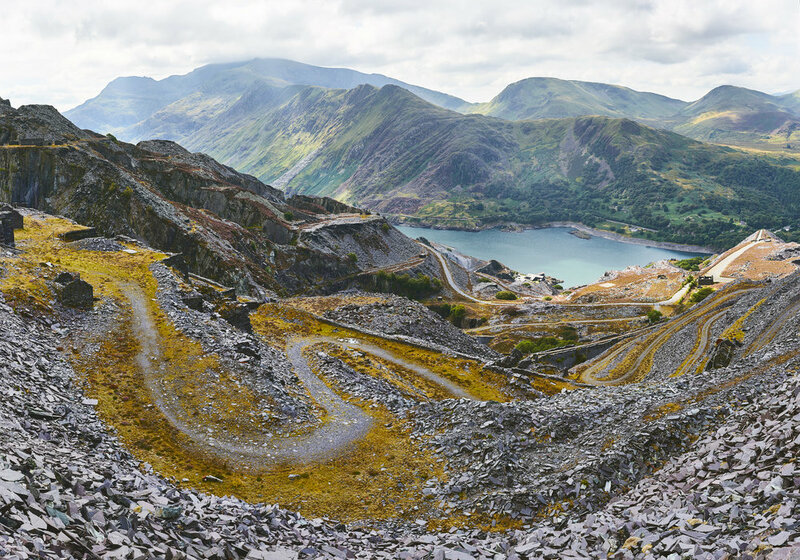 Penrhyn and Dinorwig were the two largest slate quarries in the world, and the Oakeley mine at Blaenau Ffestiniog was the largest slate mine in the world. Dinorwig was closed in July 1969 after hundreds of years producing slate but it’s still open to the public and home to the National Slate Museum of Wales. Easter - October: 10.00am - 5.00pm, daily. November - Easter: 10.00am - 4.00pm, closed Saturdays. Although very busy with August day trippers we found Portmeirion to be a wonderful escape; reminiscent of the Mediterranean town of Portfofino, especially in the late summer sunshine. We stayed at a charming guesthouse in the village of Penrhyndeudraeth. Overlooking the estuary of the River Dwyryd it's just 5 minutes drive from it’s famous architectural neighbour. Walking off dinner, we ventured down to the water’s edge and met our host's brother: Salt Marsh farmer Rhodri ap Gwyn bringing his sheep up from the encroaching tide. Rhodri’s Salt Marsh lambs graze happily on a combination of plants full of nutrients and minerals found only on land flooded regularly by sea water. This diet leads to a distinctive flavour and meltingly tender texture which is significantly different from mountain lamb and allows him to rightly sell under the Salt Marsh name. The strict criteria in terms of the land flooded regularly by the tide, the grazing time on the ‘saltings’ and the husbandry of the animals, ensure that the product is of the very highest quality and worthy of its worldwide reputation. Portmeirion is a village in Gwynedd, North Wales designed and built by Sir Clough Williams-Ellis between 1925 and 1975 in the style of an Italian village, and is now owned by a charitable trust. The village is located in the community of Penrhyndeudraeth, on the estuary of the River Dwyryd, 2 miles south east of Porthmadog, and 1 mile from Minffordd railway station.